(FROM LEFT TO RIGHT) KIEHLS FACIAL FUEL, PIXI NOURISHING SLEEP MASK, NEUTROGENA ACNE PROOFING GEL, HERBIVORE ROSE HIBISCUS FACIAL MIST, NEUTROGENA HYDRO BOOST 50SPF, KIEHLS POST-SHAVE GUARD. If you have been reading NevNYC since the beginning you know that I have always used Dermalogica’s Active Moist as my daily moisturiser, a brand that my Mum’s beauty salon works with. I had been using it since I was 15 and loved the results! However back in July I ran out of it during my stay in Scranton. My friend Micah suggested Kiehls Facial Fuel and when I tried it I instantly fell in love. It’s equally as super-absorbant as the Active Moist and I loved the peppermint scent. I always gravitate towards fresh scents (mint, cucumber etc) and so I knew this was the new product for me. You can also get it in an SPF! Now this is a product we’ve actually had in our bathroom cabinet for a while. Gino is a big fan of the Pixi products and got me onto their hydrating mist back when we used to live in his studio apartment. Whilst changing up my skincare routine I wanted something that could moisturise my face overnight so I wake up feeling fresh. When scoping about the products we already have I came across the Pixi Nourishing Sleep Mask and I cannot tell you enough how great it is. When my skin is feeling a little tired from the day, I wash my face and put the mask on. It goes on so nicely and I wake up feeling refreshed and replenished. I highly recommend this product if you tend to avoid sheet masks or over-night serums! This past few months on my Instagram I have been working with Neutrogena. I have always been so worried with teaming up with brands, but I always vowed to work with brands that I genuinely use. Neutrogena was a brand that I started using back in my teenage “acne” years and loved the results, so when offered the opportunity to work with them I couldn’t say no. Their products are super affordable and accessible! The first range I worked with them on was their “Acne Proofing” range, I used the Exfoliating Scrub in one month, but the life-saver has really been their Gel Cleanser. I am now on my second one since receiving it in May and using it everyday. It has been the perfect product after a long day. I keep it in the shower and use it on a morning or night instead of an exfoliating scrub and the results are a dream. After patting my face dry with a towel I put on my daily moisturiser and we’re good to go! I never really understood the purpose of a face mist, but back in Scranton, Gino picked up this face mist from a gorgeous little boutique in the town square and began using it every hour or so if we were out and about. Low and behold, since being back in the city, this face mist has been an absolute God-send. It is so refreshing when running about the city to put on to refresh and waken. I also find that it reduces any redness in my face throughout the day (products containing rose are a huge help in doing this). A face mist is a great thing to have in your bag throughout the day! The latest range I worked on with Neutrogena was their “Hydro Boost” range. A range aimed at moisturising throughout their various products. One product I couldn’t wait to get my hands on was their Hydro Boost SPF. When arriving back in the city, summer was still in full swing. The hot, smelly and sunny streets of New York can do so much damage and I was really looking for a sunscreen that could protect and hydrate my skin in the sun. The first time I gave it a go was when I headed to Rockaway Beach with some friends and I loved it. I applied it three times throughout our 3 hour beach trip and it is so durable. It instantly soaks into the skin and doesn’t leave you feeling sticky or irritated like some sunscreens. I highly recommend! Now this I think is perhaps my favourite product that I am talking about today. In the past year or so I have been clean-shaving my neck to give my stubble some shape (and to fake a jawline LOL). But throughout the year I have had occasional flare ups with redness and irritation through the various products and razors I use. I finally went into Kiehls and asked for advice where they recommended their “Post-Shave" Repair Gel”, and I have to tell you, it really has been a saviour. My routine tends to be, exfoliating my neck pre-shave. Followed by shave cream, shaving the area. Dabbing the area dry with a towel before finishing with the Post-Shave Repair Gel, making sure to apply it in the direction I shaved. The results have been insane and has cleared up my neck area so much! Definitely give it a go if you shave regularly! If you had asked me a few months back to do a sheet mask with you, I would’ve been reluctant. A lot of sheet masks I have used in the past have left my skin feeling quite sticky rather that moisturised. However since getting back into the city, I am obsessed with K-Beauty brands and their natural sheet masks. When attending the Lanyu Couture runway show at New York Fashion Week, we were all gifted a huge bunch of natural sheet masks and I am now. OB. SESSED. I’ve been using them every other day and I cannot hype them enough. I highly recommend looking for some containing natural ingredients. K-Beauty brand “Innisfree” have a fantastic range of natural sheet masks priced at $1.80 and they are well worth giving them a go. Be sure to speak to a member of staff if you are looking for a sheet mask for a specific purpose and they are honestly so so helpful! I hope you guys enjoyed this quick little blogpost. I love reading different recommendations from other bloggers and thought it might be nice to share the products I am using at the moment. 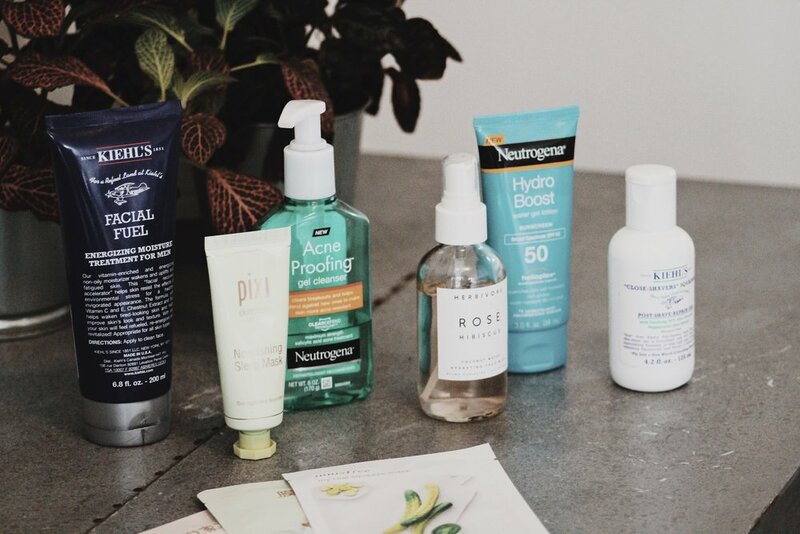 As a little disclaimer, this blog post is posted outside of my Neutrogena campaign. If I ever have a sponsored post you will see “AD” in the title and per the posting guidelines and laws. All views here are my own and I will continue to only share recommendations of brands I actually use and love! I would LOVE to hear some of your recommendations, any products you use in your routines or any skincare tips/tricks you know in the comments below or on any of my social media!